Agile methodology is a project management approach, mostly used in software development, that takes incremental, iterative steps to make progress on a large (possibly incompletely defined) project. Each incremental step is a working solution. The customer can use this solution, assess it, and then better identify the next level of improvement. An Agile Facility planning approach can be useful to get better facilities for an organization while anticipating unpredictable future conditions or lacking a sanctioned Strategic Facility Plan. Since you are reading this article, let’s presume that you are familiar with the premises behind the Strategic Facility Guide, and want to know how you can use a rational approach in the face of uncertainty. Nothing in this post negates the value of having a Strategic Facility Plan, however vague, to guide your decision making. Rather an agile facility approach is akin to using a compass for your journey instead of a GPS. 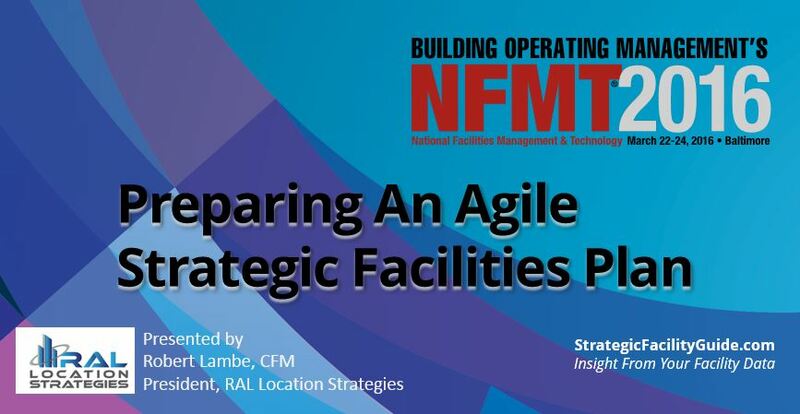 The main difference between these approaches is that the agile facility planning approach is based on the current conditions and the Strategic Facility Planning approach is based upon a more specifically defined end state. An agile approach will include many of the same steps and activities common to all planning, with some different emphasis and nuances in execution. The foundation for your agile plan is the overall assessment of your current facilities with respect to your current business needs. Your information and assessments will only be as detailed and accurate as your available information, consistent with a Strategic Facility Assessment. While you will not have an end state “master plan,” you still need some idea of direction. Forecast the likely business environment and corresponding business facility needs so you can identify the fit of your current facilities. The forecast will be shorter-term and only as detailed as schedule allows. Visibly document your working assumptions as the basis for decisions made in the next step. The assessment and forecast will identify a number of actions that can improve the facility portfolio for the anticipated business needs. (Actions can be capital projects, technical studies, or changes in operating practices.) These actions can be prioritized to focus on those that provide the best value or are most urgent. Customer involvement in establishing the priorities is important, balanced with the range of other factors use for capital planning. Use good project management to implement the selected actions. This step of the process is the same no matter which approach you use. Feedback on the relative success of the selected action is the only way to track progress and quantify the benefit of the actions. This suggests that an ongoing benchmarking program or other before/after measurement system should be in place before the changes are made. Keep in mind that not all measurements have to be units like cost – qualitative measures of performance can also be important. The measurements will logically be used to update your facility assessments, and the cycle is repeated. When is Agile Most Useful? There is no sanctioned Strategic Facility Plan so you need a bottom-up approach. There are limited resources to execute the sanctioned plan. The environment is very dynamic and uncertain so no-one wants to plan. There is the perception that an incremental approach does not allow large “step-function” improvements in your operation. But there is nothing in the agile facility planning approach that limits the size of the actions you undertake. An approach like this with built-in assessment of benefit can help you confirm and quantify the value of any size action. There is also the perception that an incremental approach is inconsistent and potentially wasteful. This can be true, especially with roll-out of a proven standard that you need consistently applied. On the other hand, it can be a less risky way to concurrently pilot or field test alternatives to see which works better in your situation. Agile facility planning needs to be part of your toolkit, for those times that you believe it to be the right tool. This entry was posted in Facility Assessment, Strategic Planning on February 17, 2016 by sfg-admin.